Got up and walked Mix. Breakfasted in the farmhouse and soon afterwards Tom and Dorothy arrived with Spike. Spike and Rowan played in the garden while the rest of us set about getting as much done as possible in the Stables. In fact by the end of the day we had achieved great things – the Stables are almost all painted. The ramp wall has been constructed and fitted, the two holes in the walls have been covered, the big frame for winding thread has been mounted on the wall. It has been a good day. Meanwhile Mum went off to see her friends in Galashiels (by bus), Cathy has stripped one of the old dining room chairs and is well through upholstering it. Digger has been busy with his allotment and Olive has been reorganising the farmhouse. At lunchtime Cathy, Rachel, Dorothy, Tom and I dined at Pearsons, did some shopping and I went off to the Police Station to see how I would get to Gavinton Church on 1st. June (because it is the Jim Clark Rally and many roads will be closed). The lady on duty gave me the number of the Police Officer in charge in Edinburgh. I telephoned him and he told me that there would be no difficulty about driving straight from Mount Pleasant to Gavinton on the Sunday morning. 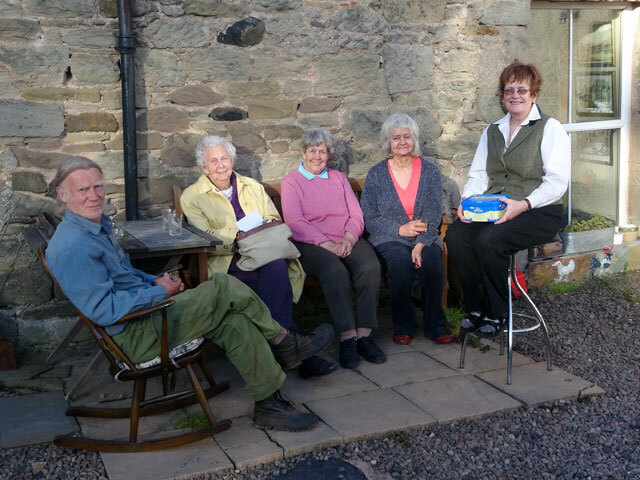 Before supper we gathered for a drink in the courtyard and after supper we went across to the Granary where we were joined by Cathy and Mum to watch a bit of the Ukulele Orchestra from Sydney Opera House, the News and Have I Got a Bit More News for You on television before bed.